Gosaikunda Lauribinala trek or lauribinayak pass trek is a popular pilgrimage trek/tour destination worshiped by Hindus and Buddhists. There is a legend that once upon a time there was a war between the Gods and the demons a very poisonous substance produced while preparing AMRIT (immortality syrup), none of them wanted to take the poisonous substance which was going to spoil the world. Furthermore, Lord Shiva decided to drink this substance to save the universe. Shiva drank and put it in his throat. Lord Shiva started feeling troubled so he lying on the mountain, hit the earth by his Trident weapon pulled water out from the earth to cool his throat from the effect of poison. This turned into spring and is still there. You can see the statue of Lord Shiva in middle the lake only if the lake is quiet. Moreover, the trail has a cultural belief, people celebrate great festivals two times a year and they are especially important in shamanism. 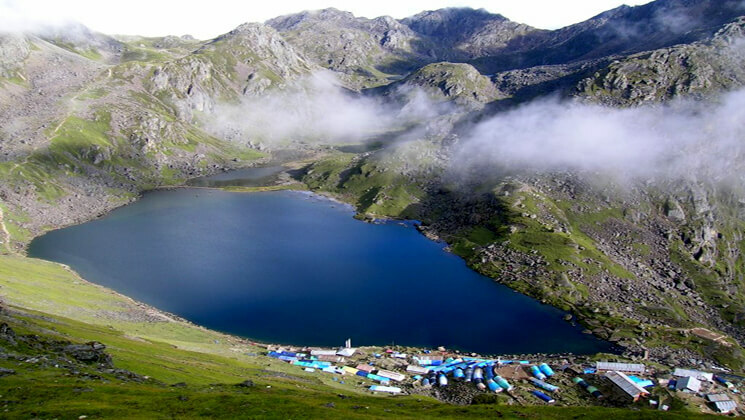 There are 108 pristine lakes around gosaikunda lakes. Some of them you are passing along the journey are Bhairab Kund, Dhudh Kund, Nag Kund, Saraswati Kund, Barda Kunda, and Surya Kund.. etc on your journey to Lauribinala pass. lauribinala pass located at an altitude in 4,630 meters offers an outstanding view of the tallest Mountains and the green valley than we descend to Helambu valley. It offers comfortable accommodation with delicious cuisines run by the local inhabitants where you can touch the local hospitality. Besides that, you can experience in Gosaikunda lauribina la trek as off The Beaten Path trail, Low-risk factors, financially cheaper, unspoiled culture and natural biodiversity, beautiful mountain scenery, Buddhist Monasteries…etc. Gosaikunda Lauribinala trek is a part of Great Himalayan Trail (GHT) trek in Nepal can be done in any time (except January – February) through out the year. Scenic drive to Dunche Bazzar, diverse in flora and fauna, Explore Hinduism & Buddhism culture, Most visited pilgrimage destination Gosaikunda inclusive 108 lakes, best view of Langtang Lirung (7246m), Gangchhenpo (6388m), Dokpu (5930m), Yala Peak (5500m), Naya Kangri (5846m) ..etc, rugged rocks, grassy lands etc. Gosaikunda pass trek / tour or gosaikunda hiking is suitable for all age walker looking for something a little more challenging but it does not require any previous trekking experience. If you are healthy and can walk 5 to 6 hours daily, you can complete this trekking. However, daily jugging or walking exercise is useful before you departure. Our program always include rest days and build up gradually, in order to acclimatize to the altitude. On trek, you can go at your own pace, with plenty of stops for resting. February, March, April, May, June, September, October, November and December. Upon your arrival at the Tribhuvan intl. airport our representative welcomes you and assists to transfer in your hotel in Kathmandu within BB Plan. After time to get refreshed, and briefing about your trip and overnight at Hotel. In the morning after breakfast, we visit Boudhanath, also known as Little Tibet. Then we visit Pashupatinath, holy temple of Hindu where cremation takes place by the holy river Bagmati. Later we visit Patan Durbar Square, Kathmandu Durbar Square, and Syambhunath Stupa. And transfer to hotel. At early morning, our guide will come to pick you up at your hotel, meet the crew than drive on a northern highway over mountain ridges to Dunche bazaar. During the journey, you drive through picturesque landscapes, mountain scenery, and local tiny villages. From Dunche, we’ll have magnificent views of Mt. Ganesh Himal, Manaslu and Mt Kerung of Tibet. Stay overnight at guest house. After breakfast in Dunche, our trek begins within green terraces and we continue to ascend to Sing Gompa via forest. The view of a mountain will be wider day by day. We will see the Langtang range, Ganesh Himal, Tibetan Monastery, once we reach Sing Gompa. We walk through a forest of Oak, hemlock, and firs. We also will visit Local cheese factory there. We stay there overnight at lodge. Climbing steeply from Sing Gompa at several points the trail crossing behind the ridges moves in deep forests to Cholang Pati, the journey is very easy until Cholang pati. Continue our trek on the way to Gosainkunda passing Laurebina Yak or recognize a lower Lauribinala hill station. We continue to ascend to the ridge and then climb to Saraswati Kund and Bhairav Kund continues climbing gently and then drop about 20m to reach Gosaikunda lake where we stay overnight. A tough day of whole trekking. Leaving Gosaikunda the trail moves to Gopte, passing three more pristine lakes, we reach to Laurebina La upper hill station which is located at an altitude of 4,630m / 15,140 ft, then easy descend downhill to Phedi, from where the route drops to a stream and crosses the head of the valley, descending to Dupi Chaur, with all these ups and downs we make a final ascent to Tharepati, a windy ridge. Overnight stay in lodge. The trail continues through the forest of pine and juniper about 2 hour’s slope up to Thadepati. Except ascending to Tharepati, the rest of the trail will descend. Sufficient hotels, lodges and temporary tea-house are available on the route. Attractive Mountain views as well as local peoples’ lifestyle, culture; customs would be an additional subject of interests. Trek within gentle ups and downs following a ridge to reach Chisapani hill station with excellent views of Himalayan range from Mt. Manaslu to Mt. Everest with spectacular sunset view.. Climb to the small pass at Burlang Bhanjyang and take a last look at the great line of the snow peaks of the Himalaya before descending to Sundarijal and drive out to Kathmandu from Sundarijal. This pleasant day you may have the full day at leisure and either relax at the hotel or explore Kathmandu city, shopping etc. Drop you in Kathmandu International Airport onward your final destination and our trip ends. How much does Gosaikunda Lauribinala trek cost? About Gosaikunda Lauribinala trek or Gosaikunda Lauribinala pass trek price will vary according to group size you are coming with. 3-star category hotel deluxe air-conditioned room in Kathmandu (BB PLAN) and 2 / 5-star hotel standard accommodation in Pokhara (BB plan) with attached bathroom while on trekking on possible places. AND WE ARE OPEN TO CUSTOMIZE YOUR TOUR AND PACKAGES PRICE AS PER YOUR REQUIREMENTS. International tour leaders are highly encouraged to get discount and attractive complimentary. Kathmandu international airport transfer by private vehicles. 2 nights twin sharing on tourist standard accommodation in Kathmandu. Guest house basis trekking accommodation while on trekking days. Bus transfer from Kathmandu – Syabrubensi and from Melamchi to Kathmandu . Fully escorted trek with fluent English speaking license holder local guide and each 2 guest 1 Porter basis. All land transportation as per written on above itinerary. Food and accommodation and salary of Nepali trekking staffs. Insurance of guide and porters. Lunch and Dinner during the staying in Kathmandu city. We can organize private Gosaikunda Lauribinala trek starting at any date that works for you. Please contact us for more information. Guaranteed – Trip is Guaranteed to run. Available – Trip is available to run if minimum group size is filled. Limited – Only few space available. Answer: Yes sure !! If you provide us your Kathmandu arrival flights details then we come to pick up you in Kathmandu international airport. Question: Do I need experience for Gosaikunda Lauribinala trek? Answer: Gosaikunda Lauribinala trek is suitable for keen trekkers/walkers who can walk about 5 or 6 hours in a day, with a lightweight rucksack you can complete this trip. Question: What kind of accommodation can I expect on express Gosaikunda Lauribinala trek? Answer: We provide you hotel accommodation in Kathmandu (you request us for category) and during the trekking, there would be guest house accommodation which offers basic clean facilities with a mattress and blanket. We recommend you to take sleeping bags for better clean. Question: What kind of food can I expect in gosaikunda pass or lauribina pass express Trek? Answer: All the guest houses along the routes they have attached restaurant and they cook a delicious range of mostly vegetarian such as Pasta, tuna bakes, noodles, potatoes, eggs, dhal bhat, bread, soups, fresh vegetables (variety depends on the season). Question: What opportunities will I have shower along Gosaikunda Lauribinala trek? Answer: As you are trekking guest house style, you always stay overnight at guest houses or lodges. They do have a shower which you can get it somewhere on pay and somewhere without paying. Question: How do I get drinking water on Gosaikunda Lauribinala trek? Answer: During the Gosaikunda Lauribinala treks route there are all places hotel and shops where you can able to buy mineral water and you can buy it for drinking but however we advise against buying mineral water in plastic bottles, as currently there are no provisions for disposing of these. Instead, we provide you boiled water or bringing chlorine tablets to purify the normal water as the normal water is available in campsite/along the way in the camping trekking. Question: Can I charge my digital camera or mobile batteries on my trip? Answer: During the guest house trekking there will be enough chances to charge your battery. We recommend you bring an extra pair for in case. Remember to bring your own adapters! And we recommend you to take extra batteries along with you. Question: Is there any communication facilities on gosaikunda pass lodge Trek? Answer: Yes ! you can get telephone services as well as internet services in some places. Question: Can I use credit cards in Trekking? Answer: No, for the trekking you need to have cash because credit cards work city area of Nepal only. Answer: Because our trips book up months in advance, we recommend booking early to avoid disappointment. We will, of course, make every effort to accommodate last minute bookings. We prefer 20 % advance deposit of the total price of a trip in order to confirm your reservation before you arrive in Nepal. And the rest of the payment can be made after your arrival. Question: Who will carry my luggage on gosaikunda and lauribina pass short Trek? Answer: We provide porters they will carry your luggage. Question: Is there any communication while we are on gosaikunda and lauribina pass short Trekking? Answer: There are telephones in many villages along the popular trekking routes from which you can make international calls. Answer: When walking/trekking in the mountains, the distance you cover each day can vary greatly due to a gradient, terrain, and altitude. You have to be prepared to walk for 5-6 hours each day. Question: Do I need walking polls for Gosaikunda Lauribinala tour? Answer: We recommend to take that it will be the help to you. Answer: You can allocate US$ 08 – 10 for lunch/dinner in Kathmandu and it depends on your spending habits. US$7 to 10 US$ a day will be enough to buy bottles of water, chocolates, tea coffee and some drinks in trekking. Answer: The above itinerary about Gosaikunda Lauribinala trek tour is subject to change due to a condition beyond our control. This is a Guideline showing tentative camp night stops. The physical, technical and natural condition may change these above itineraries. Great trekking company and excellent guides ! This was our first visit to Nepal. We had an excellent experience with Gokyo treks company. We appreciated the personalised service we received from Ammar and would definitely use his company again. Hours: Open today: 7AM–7PM (Everyday).